Come back for more Raspberry Pi articles next week as we celebrate 3.14 on March 14, 2018. Setting up a typical school computer lab with computers, monitors, keyboards, cables, switches, and more can quickly become very expensive. In developing and less prosperous countries (which comprise the largest part of the world), it's common for several hundred students to share a single computer. Even in the developed world, small schools and clubs with small budgets often are poorly equipped with technology. 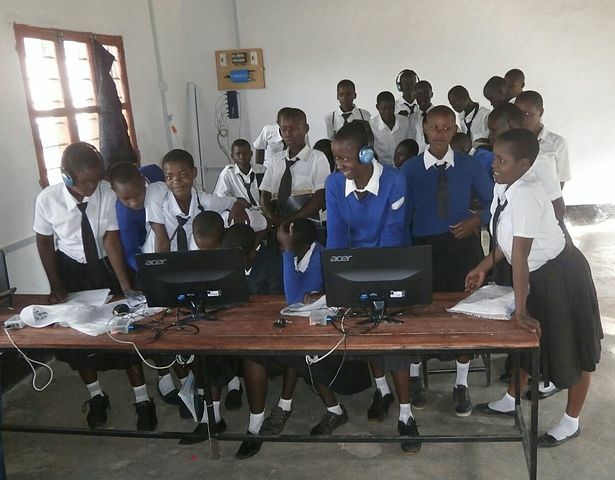 Tanzanian students at Mekomariro Secondary School with Raspberry Pi systems. The Raspberry Pi offers a low-cost alternative to traditional, expensive school computer labs. In fact, with Raspberry Pi, it's possible to set up a complete, reliable, low-maintenance computer lab for under US$ 1,500. If you would like others to use the computer lab, the system must have few technical hurdles and be easy to manage (e.g., management shouldn't take several hours per week). If you have a US$ 1,500 budget to set up a computer lab, it's crucial to save money on hardware. Most of the things students do in a computer room today require only a browser and possibly an office suite. They don't need the latest, most powerful hardware. A set of Raspberry Pis or used computers is quite sufficient. If monitors or other hardware are donated or already available, you'll have enough money to set up more workstations. There are many projects for the Raspberry Pi that make administration and maintenance of the computers very easy. For example, the PiNet project, developed for schools several years ago, offers central user and storage management so students can log into any computer and access their data. Recently, the Raspberry Pi Foundation released a similar project, PiServer, which doesn't limit its focus to schools. It also centrally manages users and storage. The Raspberry Pis start over the network and do not require an SD card. Or you can set up a Raspberry Pi the way you want, then distribute this image to the other computers. A central Samba server is used to store the work results. Like with every project, there are advantages and disadvantages to building a computer network with Raspberry Pis. Learning software (which usually requires Windows) may not run because PiNet or PiServer are running on Linux. It's unfamiliar to most colleagues. Man is a creature of habit, and many people reject what they don't know. Offering an introduction, a tutorial course, or further training can decrease the fear and make people more comfortable with a new system. The Raspberry Pi may not be powerful enough for compute-intensive applications that you want students to use. The Raspberry Pi's network interface is not very fast (hopefully this will change in a future version). Another solution for schools with a bit more money is to use linuxmuster.net with more powerful, used computers. It provides more opportunities, including the ability to manage many computers (Ubuntu/Windows) with relatively little effort. If you use a Raspberry Pi-based computer lab at your school or club, please share your experiences in the comments. This article was first published on openschoolsolutions.org and is republished with permission. Great article! Thanks for sharing your expertise. I shared this far and wide in education circles. The one with an HDMI input are more expensive, but DVI with an adapter is totally fine. They are much cheaper. In Europe and also in Asia there are companies that sell used hardware for a very good price. You can get a good monitor from HP, Dell, ... for even less than 50$.